We meet at the Whitt’s End Wine and Cocktail Bar in the heart of Hoylake on the Wirral. This friendly inn A nautical themed bar in the heart of Hoylake, serving cocktails, wine, beer and a selection of premium spirits. Keep an eye out on their facebook page for upcoming events. The Ship Inn is on Market Street, Hoylake, CH47 2BG. Click here to view on a map (launches a new window). 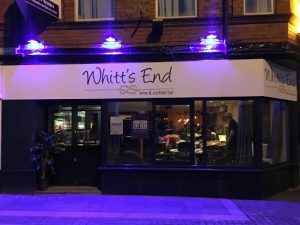 Whitt’s End is a 5-10 minute walk from either Manor Road or Hoylake Merseyrail stations, with trains every 15 minutes from Liverpool and West Kirby.